Potty training. Just mentioning it can bring terror to some parents! It can definitely be a stressful time, but it’s something every parent has to go through. 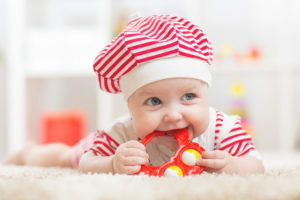 Luckily, there are a few tips and tricks that can make it less painful, and that includes getting the most-suitable potty chair for your child. A good potty chair can make potty training much easier – both for you and your child! Choosing Between Potty Seats & Chairs: Which Type? These are potties that are simply a small chair with a hole in it and a pot which is removable for cleaning. These are typically the best potty chair for children who are just beginning to be potty trained because they are very stable and don’t require your child to climb up onto it or flush it. Another perk is that they are portable — you can easily move it between bathrooms, or even take it to the babysitter’s or grandma’s house, if need be. 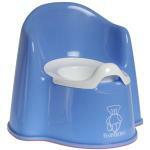 Potty chairs can be rather inexpensive, which is always a good thing for any mom or dad. Another neat thing about potty chairs is that they come in a wide variety of designs, and you can choose one that would appeal most to your particular child. This can make it more appealing for them to use, which always helps when it comes to potty training. Some potty chairs have built-in features that can make it fun to use, too! For example, some of them are designed to look like an actual (but smaller) toilet, complete with a flushing sound that imitates your toilet. This is neat, and also helps encourage your child to use it. Other potty chairs might play music or be designed to look like a cute animal or other object. Again, there is a lot of variety in the different potty chairs out there. 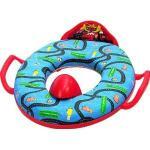 These potty seats sit on top of your toilet to make the seat smaller and more safe for your child. These are best for teaching your child to transition over to using the toilet, and are therefore generally better for slightly older children. However, a step stool can be used to help a younger child reach the toilet, if need be. What’s nice about these toilet seat adapters is that the waste can be flushed immediately and it doesn’t need to be cleaned out, unlike a stand-alone potty chair. The only cleanup you need to do is wipe it off once in a while. Depending on the type of potty seat, it may be more portable than a potty chair. If it can be easily removed, it makes it more convenient than a potty chair when you need to travel. On the downside, potty seats are not always completely stable. The best type of potty seat would be one that clamps onto the toilet so that it can’t move. Unfortunately, that might make it inconvenient for everyone else in the house. Another issue some parents face is that toddlers can be very curious. The toilet is always an interesting place, and having a potty seat in place might make it an appealing place to explore. If you opt for a stand-alone potty chair, it would probably be a good idea to purchase a small step-stool to help your child climb up and use it. Sometimes they aren’t completely stable depending on the type. Now that you know the main differences between a potty chair and potty seat, it’s time to choose which is best for you and your child. I think that your child should have some input on the subject, but it’s up to you to decide which type of potty is best, and then give him or her some options to choose from. How will it affect the rest of the family? — The type of potty you choose could make a big impact on the rest of the family. If you have only one bathroom in the house, consider the fact that a potty seat might be a huge inconvenience for the rest of the family. If you’re going to get a potty seat, you might want to get one that is simple to remove, or flips up and down for when other people need to use the restroom. Will I be travelling and need to take the potty along? — If you’re going to be travelling a lot—say, to grandpa and grandma’s house or taking your child to a babysitter—then you might want to keep that in mind when deciding on a potty. Some potties are specifically-designed to be portable, but that doesn’t mean that they’re great for everyday use. A good compromise would be a good potty that is easy to transport if the need arises. The age of your child is important. — For young children that are first beginning to be potty trained, a potty chair is often the better choice. They are closer to the ground and don’t require climbing, are generally more sturdy and easier to use for a young child. However, some children might be okay with using a potty seat that goes over the toilet along with a small stool. It really depends on your personal situation. Don’t be afraid to purchase a different seat — Potties are generally not very expensive, so it’s not like you’re putting a big risk into purchasing one. If you get a potty and your child doesn’t like it or can’t use it properly, it’s okay if you have to purchase a different type. It can sometimes be hard to tell how well a potty will work out until your child actually tries to use it. Let your child have a say — This is something many parents neglect! Since your child is the one that’s going to be using the potty, it’s very important that he or she likes it. When you narrow down your choices and have a few different potties in mind, let them choose one. A potty that your child chooses and likes will make it much easier to potty train them, and it makes them feel more grown-up knowing that they made a decision themselves. Even if they choose one that’s flashy or expensive, it’s worth the extra money if it’s the one they want.